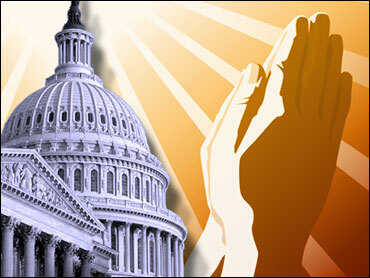 About two dozen members of Congress on Wednesday condemned a federal judge's ruling that the National Day of Prayer is unconstitutional, saying prayer has long been part of the country's history. "The American people believe in prayer. The American people believe that prayer changes things," said Rep. Mike Pence, R-Ind., as he urged the Obama administration use "all means at its disposal" to challenge the decision. Several of the lawmakers also called on the Justice Department to appeal the ruling. The government has yet to make a determination as to what its next step will be, said Charles Miller, a Justice Department spokesman. The ruling is still being reviewed. Congress established the day in 1952 and in 1988 set the first Thursday in May as the day for presidents to issue proclamations asking Americans to pray. Matt Lehrich, a spokesman for President Barack Obama, said Wednesday the president still plans to issue a proclamation for the upcoming prayer day. The Freedom From Religion Foundation, a Madison, Wis.-based group of atheists and agnostics, filed a lawsuit against the federal government in 2008 arguing the day violated the separation of church and state. The Obama administration has countered that the statute simply acknowledges the role of religion in the United States. In her ruling, U.S. District Judge Barbara Crabb wrote that the government can no more enact laws supporting a day of prayer than it can encourage citizens to fast during Ramadan, attend a synagogue or practice magic. Rep. Mike McIntyre, D-N.C., said the National Day of Prayer proclamation doesn't force anyone to pray. "It's an opportunity for us to do what we've done historically, what our historic underpinnings are and understanding the precedent that has been set," said McIntyre, co-chairman of the Congressional Prayer Caucus. Rep. Lamar Smith, R-Texas, has introduced a resolution in support of the National Day of Prayer, calling it constitutional and "a fitting acknowledgment of our nation's religious history."